A relatively easy, under-4 mile hike up a canyon in the lower San Gabriels to a 40-foot waterfall. 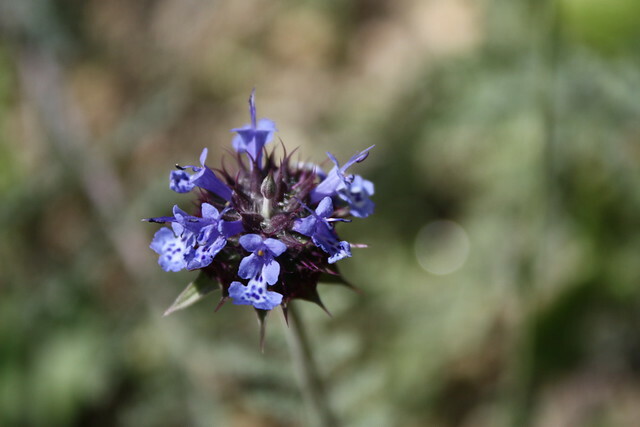 This popular trail can get crowded on the weekends, but is still worth a visit – especially in the spring when wildflowers take over the lower portions of the canyon floor. Suitable for adventurous beginners, this trail has several stream crossings, and optional, moderate trails on fire roads and single tracks through some of the eastern nature preserve outside the canyon. A must-see for waterfall lovers, even if you have to fight for a good view. 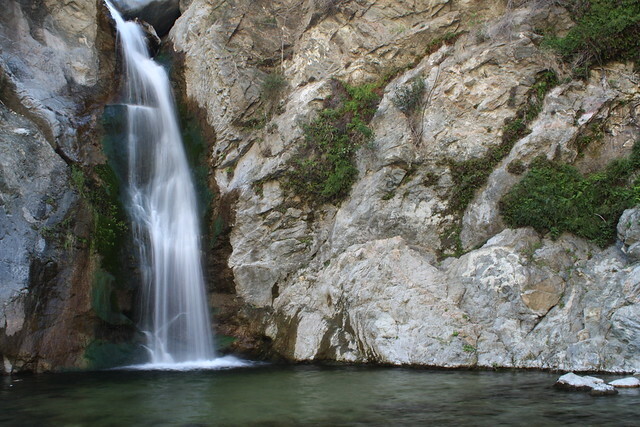 Eaton Canyon is one of those must-see hiking areas of L.A., both because the waterfall is actually impressive by San Gabriel standards, and that it’s so darn close to the city that you really don’t have any excuses not to go. The trail is easy to follow, and as long as you can hop across some boulders in a river (or have some hiking sandals to wade through), you’ll be just fine getting through the hike. If you’re lucky enough to hike this area during the springtime, you may also get to see some great blooms near the trailhead. The lower stretches of this trail are pretty level, and wind through some brush and chaparral on the way to Eaton Canyon Creek. After that, it’s easy fire road hiking as the route follows just above the banks of the wide, rocky wash of the actual creek. 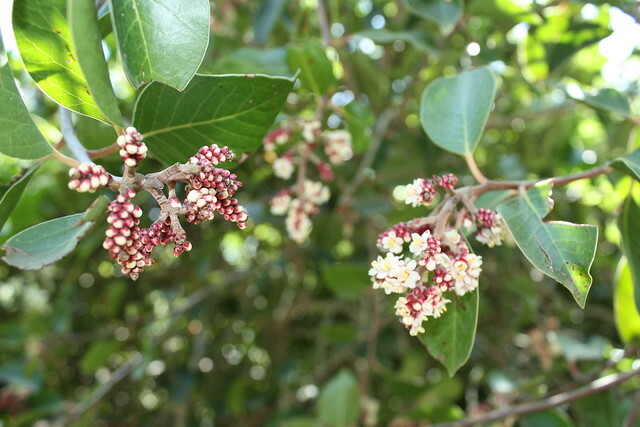 Here, the trail gets a bit more verdant, and you may be able to spot a few more wildflower blooms along the way. 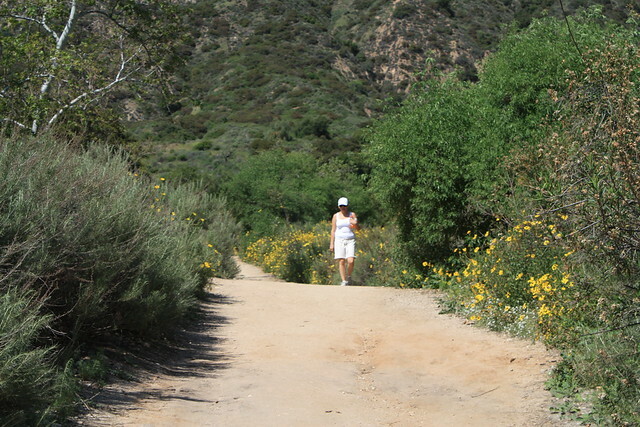 At about 0.6 miles, veer left on the Eaton Canyon Trail, heading toward the sign marked WATERFALL. It’s pretty clear. At just about the 1.2 mile mark, you’ll reach another junction, in sight of a concrete bridge. Here, head left again and follow the trail as it descends from the wider track and dips beneath the bridge. … and then you’re there! Hopefully, you’ll be able to get a little bit of peace and quiet to yourself … but even if it’s crowded, you’ll be able to enjoy the sight and sounds of falling water and the feeling of cool mist. They’re naturally relaxing, and if it’s hot, you can even take a dip in a small pool at the base of the falls. Return the way you came. Stop by the excellent Nature Center either before or after your trip. 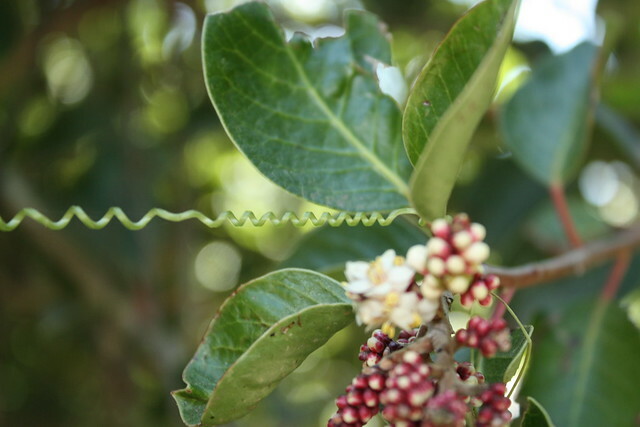 The center has an impressive display of local flora and fauna, has frequent docent-led programs, and a beautiful native plant garden. If you want to extend this trip, hang a left at the trail junction just past the bridge, and head up the steep incline of the old Mount Wilson Toll Road toward Henninger Flats. You’ll get tremendous views of the foothills of the San Gabriel Mountains, and reach a fun little museum in a historic tree nursery. There is a route beyond the first fall deeper into the canyon. This route is not an official trail and should only be attempted by those with extensive experience in climbing and canyoneering. Every year, hikers are injured and killed in the upper reaches of the canyon because they underestimate the difficulty. Don’t think just because a trail is within sight of a city that it’s not dangerous. I have not done this route, nor will I likely ever, and I do not recommend you attempt it. If you do, you are literally risking your life. Very good. Trails are heavily traveled and easily spotted. 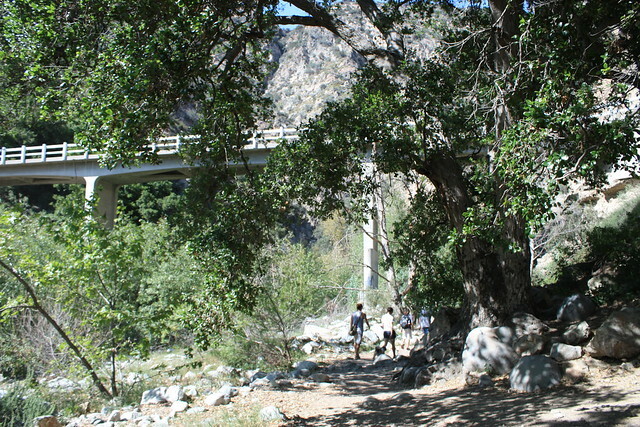 The major junction with the trail that heads toward the waterfall is clearly marked, and the official Eaton Canyon Trail has signs, but there are several use trails that spur off the main path that are unmarked. Stick to the main path for this hike, or explore the surrounding meadows and natural areas. 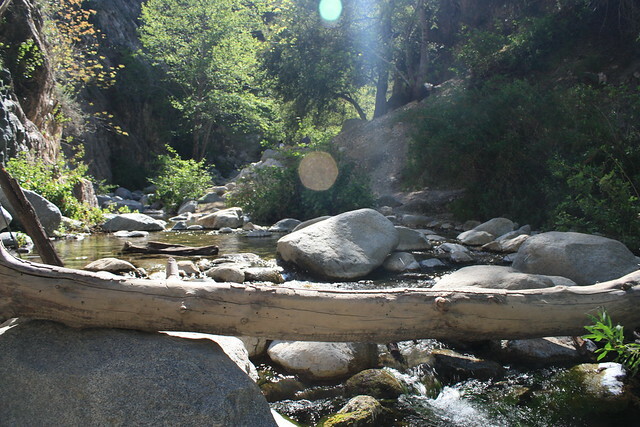 Henninger Flats is located in the San Gabriel Mountains just to the northeast of Eaton Canyon and is accessible by a moderate fire road trail. From the 210, take the Sierra Madre Blvd / Altadena Dr exit and head north. The park's entrance will be on your right in 1.7 miles. Transit accessible by Metro bus 267/264, which departs from the Sierra Madre Villa Station on the Gold Line. I love this hike! careful of snakes :) There are a lot of rocks and things where they can hide. Was a bit concerned for my dog when we were out there - definitely heard of one on our trail. But a very pretty, underrated hike if you want a quick fix of green. Did the Eaton Falls trip today 1/31/17. Was wonderful to actually see all the streams running with water and of course the fall itself after the recent rains. Eaton is one of my favorite hikes because it was my first hike. It sort of has it all---warm and sunny path, shaded path, some fun skipping across streams, climbing over some boulders, and of course the famous waterfall. It's also pretty easy---you see people from 5 years old-80 years old hiking (at least part) of the trail. But it isn't without flaw. Because of its relative easy and 'instagrammable' waterfall, you get an inordinate amount of people blasting their music on speakers (my friend and I counted 11 people last time), and there can literally be LINES to get across the streams (yes you can improvise, but your feet may get wet.) Also, at the waterfall (esp. during the summer), there can be a sort of 'party' feel that you may or may not like. Two times ago, there were some tourists playing European house music and dancing without their shirts on. In any case, it's a must do in LA. 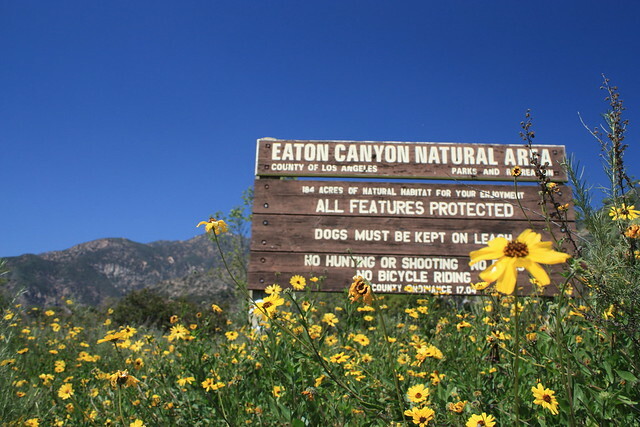 @Casey: On behalf of all the Eaton Canyon Natural Area (ECNCA) Docents, we appreciate your revision. We want the visitors to Eaton Canyon to enjoy their visit and have a safe day. OK, Hiker_Bob. Previously, you asked that I include a stronger warning - which I already did. Now I've removed the description of the scramble route and included a stronger warning. I am a Certified Docent/Naturalist at Eaton Canyon Nature Center and again I implore "Modern Hiker" to delete your reference to the "trail" to go up and around the main falls. Last year we had 4 hikers die and 60 rescues of people trying to do that trail and yesterday we had a young girl die from falling from the ridge and 3 of her friends had to be rescued. Do the right thing and drop the text/photo so as not to encourage people to try to do it. It is just not worth it. Did this hike a couple of days ago and had a great time. It was a Sunday so it was crowded as I expected, lots of families and lots of dogs and all the pollution (of all types) that come along with it, but everyone seemed happy to be in nature. I did make it up behind the falls via the "razorback" trail and that was by far the best part of the hike. Just getting from the bottom of the falls to the top is the sketchiest part. Don't use the use-trail that goes vertically up the crumbly shale wall. Instead continue on towards the falls another 30 yards and climb up the rock wall. Solid hand and footholds are much easier. There's a couple spots further up where climbers have secured rope to the rock wall to make the passage a little easier. There are warnings all around about people being injured or falling to their deaths around the razorback trail but it's fine if you're careful. The rocks near the edge of the falls are slick, so pay attention. Once you're on the top of the falls you can rock hop upstream as far as you want to go. I made it to a second falls, as big as the first with a larger swimming hole. Very pretty spot but, unfortunately, packed with trash and graffiti. But at least I got away from the crowds. Another trail led me to the top of that waterfall and I continued upstream for maybe another half mile before I reached a spot where I was going to have to get wet to continue. Really beautiful up there, it's definitely worth going to get away from the crowds and noise, just be careful.